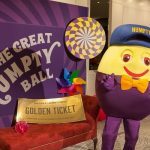 Immersive and unique staging and production by Encore Event Technologies recently transported 400 guests who attended the annual Great Humpty Ball back to their childhood. Hosted by the Humpty Dumpty Foundation, a children’s charity that for more than 28 years has purchased life-saving medical equipment specifically requested by over 380 hospitals and health services across Australia, Encore delivered an imaginative, compelling and truly sweet Charlie and the Chocolate Factory inspired event at the Four Seasons Hotel Sydney. 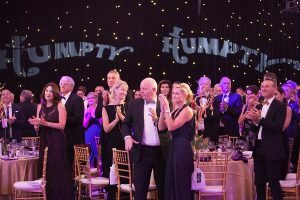 Every year Encore works closely with the Humpty Dumpty Foundation team to create an immersive gala dinner themed with fun, colour and technical magic to deliver on the charity’s vision. First impressions count. On arrival, guests entered the chocolate factory gates constructed of purple bricks and golden wrought iron gates with Humpty branded signage – a welcoming invitation fuelled with intrigue and wonder. The grass covered walk-way included boxes of Humpty branded chocolate bars, giant gobstoppers, colourful windmills, lollies and mushrooms. Purple trees decorated with lollipops and fairy lights framed the main doors of the hotel’s Ballroom. 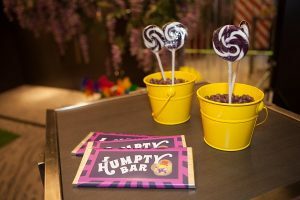 Guests were entertained by the Wonka inspired photobooth with giant windmill lollies in flower pots and Humpty signage all created to encourage guests to explore the decorated venue. The beautifully dressed tables were adorned by shiny purple cloths and Wonka inspired golden wrapper runners and two stunning centrepieces. The first, a magical garden, included intricate trees on a grassy knoll decorated with lollies, mushrooms, tea lights and miniature buckets of candy. The second included Willy Wonka’s red top hat, candy jars and colourful windmills on sticks. Mimicking the iconic “fizzy lifting” scene from the film, Encore created a bubble ceiling installation above the dance floor with long garlands of stunning sliver, white pearl and clear balloons that created the illusion of bubbles exploding out of an oversized fizzy soda bottle. Keeping to theme, the multimedia team created a chocolate river backdrop with the Humpty mascot image floating past the magical garden that transitioned into an evening scene with Humpty in a glass lift with a giant shimmering moon. The set was complimented by colourful mushrooms, gobstoppers, a lolly tree and the walls draped with sparkling star black cloth with themed Humpty gobo lighting. 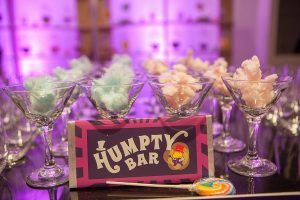 Complete with projections and staging, the Encore team delivered purple and gold themed lighting, matching both the Humpty branding and Wonka bars, which ensured guests at the event were reminded of a childhood full of imagination. “For each annual Great Humpty Ball we like to pick a theme that can take our generous supporters back to their childhood. Encore certainly helped us achieve this, creating a real wow factor when guests entered the Four Seasons Hotel Ballroom. As with each year we host this event, Encore did a great job ensuring our guests enjoyed a memorable evening”.